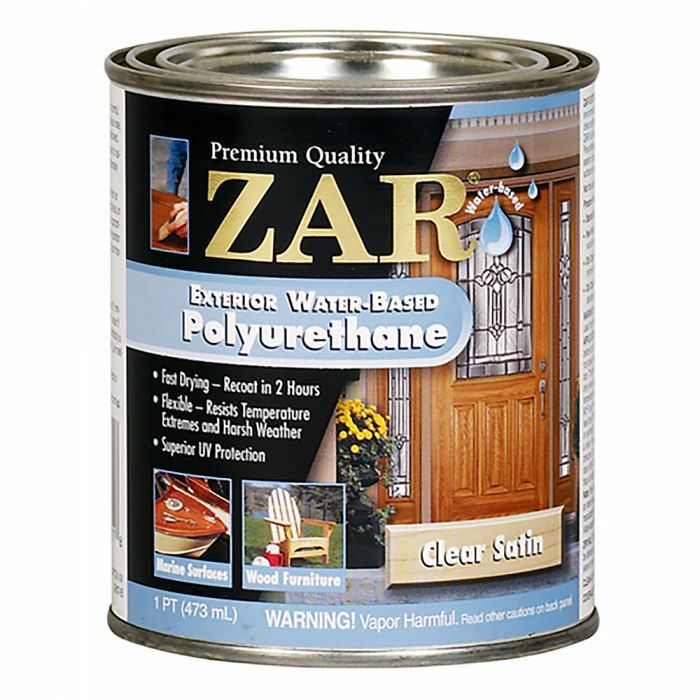 ZAR® Exterior Water-Based Polyurethane is an environmentally friendly wood finish formulated with ultraviolet radiation absorbers and antioxidants to help it shrug off the challenges of harsh sunlight, heat, cold and moisture. It is an ideal choice for exterior surfaces like doors (including fiberglass and steel doors), patio furniture, fences, gables, wooden marine surfaces above the waterline, and other wood surfaces exposed to direct sunlight and harsh weather. It goes on milky but dries quickly to a rich, amber color, and can be recoated in only 2 hours. Non-toxic. Meets all environmental standards for low emission of solvent vapors. Exterior use only. Not for use on decks. Do not apply over wood fillers or finishes containing wax or stearates. Do not use steel wool. Do not thin.